Nicole Picadura of Scraps & Stamps emailed us a while back about a website she was launching dedicated to classes focused upon stamp companies' releases and would we be interested in sponsoring a class dedicated to our April/May 2015 Release. We thought it was an superb idea! We are so thrilled to be included in this novel and fun class!! What better way to be inspired to use your new products? The "interactive" potion of the class begins on May 29th and runs through June 7th. During that time there will be an exclusive coupon code for shopping and giveaways. With a total of ten (10) lessons including video tutorials you will be sure to learn a lot and want to get crafty! Of course you can sign up for the class anytime after the "interactive" period of the class. Not only is she starting with a class dedicated to our last release but also one about Neat and Tangled's latest release. 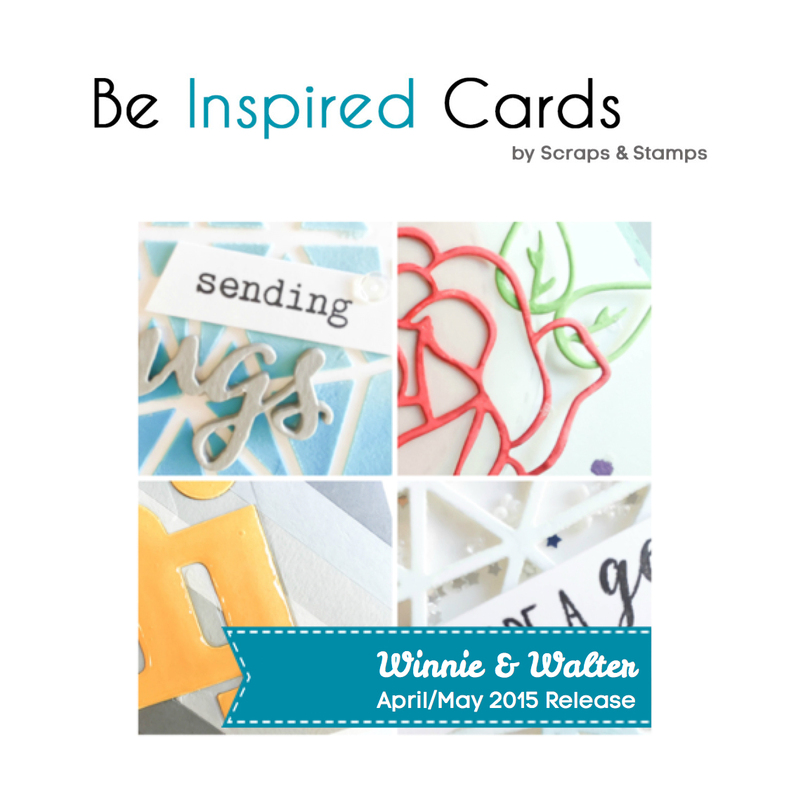 We have the pleasure of giving away 2 spots to the Winnie & Walter April/May 2015 Release! Simply comment on this post letting us know what you want to see from w&w in future releases by 11:59 p.m. CST May 27, 2015 for a chance to win. For more chances to win a spot in this class go to Nicole's blog. Love your In a Word: Cutaway series. Would love to see more words added like "thanks" and "congrats" or "congratulations". I love your floral stamps! Especially the Addie's garden one. I would love to see coordinating dies. Or maybe some layering type stamps. Thanks for the info on this class and the chance to win. I love everything you have offered so far, especially love the cutaways and the Big & the Bold Series, they are all so versatile. How about adding cutaways to match some of the existing stamps sets and MORE of the In a Word Cutaway series? Really love the font you use for the Big sentiments in the Big & the Bold series, and more masculine appropriate themes please! Thanks very much for a chance to win a spot in the class series, sounds awesome! I would love to see more word dies or watercolor stamps! Thanks! I would love to win a spot in this class!! I would love to see more stamps with matching cut aways! Can't get enough of your dies... love the flowers and words in particular! This sounds like such a fun class. I'm pretty much happy with any die that matches a stamp. I love your flowers. Cute critters are always good. Love any and all flowers! Script words are always needed! Thanks for the chance to win! Thank you for the chance to win! I love your Big & Bold series. Would love to see more of those! Love Winnie & Walter! Would love to see more word cutaways as I love the fonts you use! Would love to see anything geometric and phrases or quotes appropriate for the inside of a card. That being said, I do love your The Big, The Bold stamps and cutaways so more of those would always be nice. Also, another die collection for layering similar to, yet different from, the Katharine die set. With all the wonderful stamps I have gotten recently, a class would be great! Thanks for the chance! love the big bold stuff. dies and stencils too? yay! I love geometric and graphic/modern stuff - in fact I can never resist those....thanks for the give away - I love taking classes! Love your words & flowers. Would love to see more cutaways to match the new flowers. I love your word dies and flower stamps, I'd love to see more images to watercolor. wow! That would be wonderful to be picked for this class. It's always great to learn more techniques and the sneak peek is intriguing! Thanks for the chance to win. I love your dies and flower stamps! Just so pretty. Would love more themes in The Big and the Bold. How about one that works for belated cards? I love your unique designs. Would love more BIG greeting stamps! Loving the cutaways, keep them coming. I love everything from your last release so it's hard to think of any one else but I love, love, love word dies so more of those if anything. I would love to see more graphic word stamps and dies, but I also love florals. Sounds like an awesome class. I would like to see teen, science, masculine, school themed stamps. Everything W&W is fabulous...the thought of 'more' makes me giddy with prospects! The cutaways are top-notch as are your geometric shapes. Adding in those areas would be fabulous. Oh...and if you did some butterflies - yes, I realize they're everywhere - I know they'd be ultra-unique! Thanks for the class opportunity. Add me to the list of those who would love more cutaways - a matching set for Lola's bouquet would be fabulous - just the flowers and vases could be fantastic! Love that W&W was chosen to be included in these classes, and how cool would it be to win a spot? Very cool indeed! Thanks for the chance to win this fabulous class! I would like to see more word dies! First: I love your stamps a lot! ♥ I love the sentiments of "A tree for all seasons" - I'd love to see more of this kind of sentiments. I adore the "The big, the bold and..." series - I'd love to see a big "baby" and "wedding". Your flowerstamps are really awesome - I'd love to see some big leafs. They would be nice for watercoloring. Thank you for the chance to win! Thank you for the giveaway! I would like to see more cats. Woo hoo! This looks great! Wow that sounds great and thank you very much for the chance to win. I would love to see some animals and ofcourse further additions to the big, the bold..... Series. Either way I love everything you guys come up with. Thanks for this opportunity to win a seat in this class. Sounds like a winner. Hope she has a lot of inky tips in her segments. thanks for the chance to win! i love nicole's videos! Love the In a Word stamp sets and matching cutaways - great class idea! Thanks for giveaway! thanks for the chance. I would like to see a retirement set. Thanks for the chance, Love the word stamp sets and matching cutaways would love to get more ideas. Would love to get involved in these card making classes - look so awesome and so fun!! !